An omega block pattern is dominating over S-CNTRL Europe with a powerful upper low over E Atlantic. 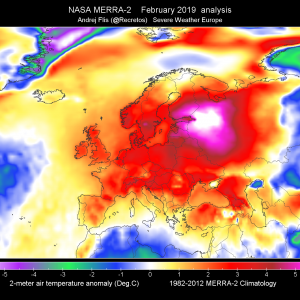 In between, strong WAA is resulting in very unstable and sheared environment across western Europe. A weak upper low remains over Turkey while a short-wave trough moves south across W Russia. 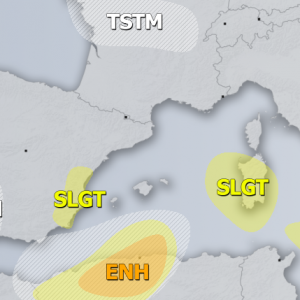 A MDT+ risk area has been issued for NW France, Belgium and the Netherlands for large to very large hail, heavy rainfall, very severe wind gusts and some marginal tornado threat. This area will require monitoring and may warrant an upgrade to HIGH risk during the day as parameters are in place for a severe weather outbreak in the late afternoon/evening hours. 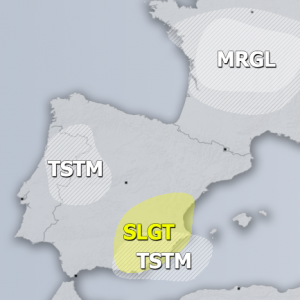 A SLGT / SLGT+ risk area has been issued for the surrounding region, including S-CNTRL France, NE Spain, NW Germany and parts of the British Isles for large hail, severe wind gusts, heavy rainfall and some tornado threat. A SLGT risk area has been issued for E Poland, W Belarus and extreme NW Ukraine for marginally large hail, heavy rainfall and severe wind gusts. A SLGT+ risk area has been issued for large parts of W Russia and extreme E Ukraine with threat for large hail and heavy rainfall. 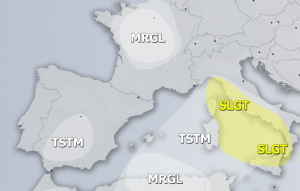 A SLGT risk area has been issued for large parts of Turkey, Georgia and extreme SW Russia mainly for heavy excessive rainfall. 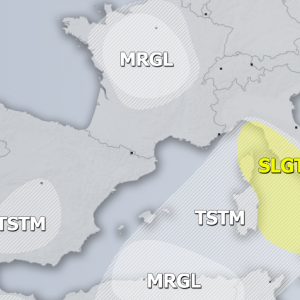 A SLGT risk area has been issued for southern Balkans mainly for heavy rainfall and marginally large hail.